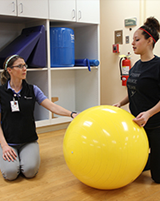 The Marianjoy Neuromuscular Rehabilitation Program is centered on improving the functional, physical and emotional well-being for its patients. increase strength, awareness, function and mobility while reducing physical limitations and pain. restore and maximize the potential of performing daily living activities. utilize compensatory strategies for the patient's new skill set. cultivate lifestyle behaviors that promote wellness. We also provide emotional support and counseling for the patient and family, education regarding the condition and resources for post-discharge. Marianjoy does not have an emergency department, but it will provide preliminary emergency services, such as first aid and cardiopulmonary resuscitation, for patients, staff and visitors. Persons will be stabilized as possible and then transferred to the nearest hospital emergency department.